My food has been a bit brown lately, so how about some green? Granted, while this soup isn’t the most vibrant green you’ve ever seen, it is hinting towards warmer weather and rainbow colored produce. I cannot wait for spring! But for now I’m stuck indoors with the rainy day blues. Thankfully this bowl of soup will cheer me up! A few weeks ago, when Barbara of Dish N’ That posted a most delicious-looking broccoli soup, I knew I had to make it. I always buy a head of broccoli at the store for back-up, in case I run out of the fresh, local produce I get in my Vegetable Husband basket, so happily I had all the ingredients on hand! With the addition of a roux of nutritional yeast I had one cheezy, broccoli, warm and comforting soup. Tres bon! But my soon-to-be bowl of soup needed a friend…perhaps a muffin? Who else to turn to but Celine of Have Cake Will Travel?! When she posted her Spicy Chick-Wheat Muffins, I was intrigued. Since I bought some chickpea flour at a run to our international farmers market, I decided it was time to whip out the muffin pan and give the recipe a whirl. While I’m not necessarily sold on the muffin by itself, accompanied by the soup the flavors shone through! Mmm soup and bread–what can be better? In a small sauce pan, heat 1/4 of vegetable oil over medium-high. Add the nutritional yeast. Whisk continuously for 5-8 minutes, until the oil and yeast form a darkened roux. Meanwhile, in a soup pot, bring the vegetable broth to a simmer. Add the rough slowly, whisking it into the broth until it is combined. Let simmer. Steam the broccoli florets until just tender, about 3-5 minutes. Rinse in cold water immediately to stop the cooking process. Set aside. In a sauté pan, sauté the onions for 5-7 minutes, or until translucent. Add the garlic. Sauté for another minute. Add the carrots, celery, and half the broccoli florets. Sauté for another 5-7 minutes. Add the vegetables to the simmering broth. Let simmer for 10-15 minutes, or until the carrots and celery are tender and cooked through. In a food processor, blend the soup in batches. Add the soy milk little by little with each batch. Return the blended soup to the pot. Add the remaining broccoli florets and heat through. Serve with these Spicy Chick-Wheat Muffins! you no likey the muff-muffs on their own? can you hear the chickpeas crying in the rain? the soup looks ace, too. How perfect- I’ve got some sad broccoli hanging out in the fridge with no destination in mind… I think I just figured out what to do with them! 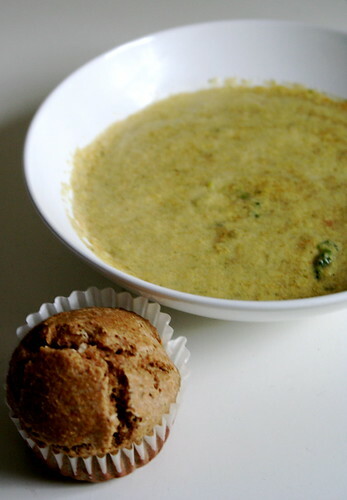 I’m a big fan of the muffins…but I’m an even bigger fan of muffins and green soup! WOOOOOT! mmm just had broccoli soup the other day. so good. thanks for the link too! Oh my gosh, love it. Sure to warm you up. And thanks for the link to the muffins! MmMMMMMmm, muffins! Yum! He he he..I do that broccoli thing too to supplement my weekly delivery. I’ve heard that the stalk works well too for broc soup..I tried recently but some parts are too, well, timber-ish..for lack of a better word! A work in process I suppose..maybe just parts of the stalk. This sounds great! I have never been inspired to make cream of broccoli soup before, but I will definitely be trying this recipe! huzzah for some glorious good soup! wow! it’s so pretty! dan & i will for sure be putting this on our “must make” list! thanks, Jes! i may have to try out those muffins – they sound interesting. think i’ll make them when i have a soup to pair them with. it’s snowy/rainy/sleet’n here and i’m ready for spring as well. i’m done be’n so darn cold! brrrrr! stay warm!